Sindri Suncatcher is an apprentice kender wizard and when he isn’t learning all he can about the magical arts from his master, Maddoc, he is writing down all he has learned about dragons. Dragons have only recently returned to his world and Sindri is fascinated by the intelligent and highly versatile creatures. Thankfully Maddoc is able to teach him a good deal about them. Sindri begins his study of dragons by looking at their basic anatomy. With excellent annotated drawings of their exterior appearance and then of their skeleton and their internal anatomy, he provides his reader with a great deal of information about what makes dragons such formidable creatures. Sindri then goes on to describe how dragons protect themselves in combat, how they interact with one another, how they communicate, and their lifecycle. Then he describes the different kinds of dragons that there are. There are two basic groups of dragons; the chromatic dragons and the metallic dragons. The chromatic dragons tend to be very dangerous and it is “best to avoid them.” Metallic dragons are not as aggressive but they should still be treated with caution and respect. Sindri goes on to describe each species in detail providing a table of “Dragon Facts” for each one as a well a written description. Excellent illustrations show what the different dragons look like, how they behave, and the habitats they prefer to live in. Once Sindri finishes his extraordinary account he decides to send it to his aunt Moonbeam Suncatcher. 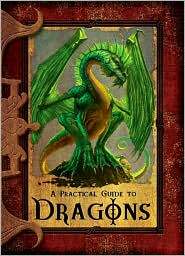 It is his hope that the guide that he has created will help her deal with dragons should she ever encounter them.